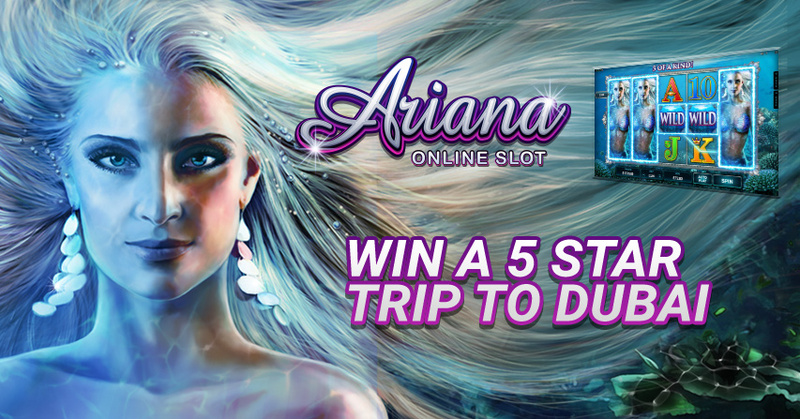 Yesterday Microgaming released a new online slot game Ariana. A 25 line slot game with an underwater theme. The game also features stacked symbols and when a fully stacked symbol appears on reel 1, all of those symbols appearing on reels 2, 3, 4 and 5 will expand. You can even trigger a free spins feature where the wild symbols appears stacked on reel 1. During free spins any stacked symbols will expand the same symbol and wild symbols on all reels. This game can theoretically give a full screen of wild symbols, paying over 300 times bet. To celebrate the release of this new game, Microgaming created a nice promotion where you are able to win a fully paid trip to Dubai. Plat Ariana between now and May 27th. For every €25,- you wager on Ariane, you will receive 2 entries. And for every €25,- you wager on Mermaids Millions or Fish Party, you will receive 1 entry. On May 28th, the lucky winner will be announced. Winning 2 return tickets to Dubai, a seven-night stay in a 5-star hotel and €1.000,- in spending money. This promotion is provided by Microgaming, so several online casinos will run this. One of them being Royal Panda, which will also be handing out 2 times €500,- in cash as an extra reward to two other lucky players.